Watch Out for Fireballs! - Blog - PRGE 2017 Final Details! Hi there! We have some final details about our appearances at the Portland Retro Gaming Expo, which runs between October 21 and 22 (Saturday and Sunday). We will be sharing booth #324 with the Retronauts. Come by, grab some buttons and stickers, say hi, and play some WarioWare! 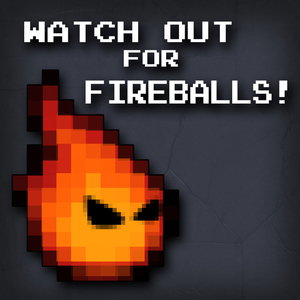 We will be doing a live episode of Watch Out for Fireballs! about the WarioWare series of games from 8:30 PM to 9:15 PM on Saturday night in Auditorium B. We'd love to see you in the audience. A combined Duckfeed/Retronauts meetup is also happening on Saturday night, at the QuarterWorld Bar and Arcade from 8:00 to midnight. Gary and I won't be there until about 10. QuarterWorld is located at 4811 SE Hawthorne Blvd. in Portland, and the best way to get there is via a ride sharing service. They also have a small cover fee at the door. We're really excited about all of these goings-on, and we really want to meet you. See you soon!